Living without petroleum products for a day was tiring, to say the least! The camera crew came to our house at exactly 9:30 am as promised. They set up a few shots ahead of time, filmed us having breakfast in our normal fashion, and took footage of, well, my feet. I should have known they were up to something when they did that. It wasn’t until it came time to figure out what we could wear that I realized I couldn’t wear shoes because all the soles were made of plastic. So they ‘filmed’ me walking in the snow in wool socks. In reality, I walked perhaps twenty paces, but it felt like walking on ice. Freezing! They were very forthcoming, however, and quickly rushed me back to the house in their van. It wasn’t really a complete day without petroleum products, but the concept was beautifully presented and they were extremely polite. As a gesture of my gratitude for their kindness (except for the sock thing), I gave each of them an autographed copy of my book SAHM I Am in German (Erkenntnisse einer Vollzeitmutti). You should have seen their eyes light up! For a split second in time, I felt like a celebrity. It was a sweet moment! The show is slated to air on March 15th. More then! I admit I used to watch Young and the Restless religiously. It was the only soap I followed and, with some irony, I was invited to an awards’ ceremony in Las Vegas last year. The host was Melody Thomas Scott, the actor who has played Nikki, one of my favorite characters on the show, for decades. After wondering for years what it is like on a soap opera set, I have been privvy to a behind-the-scenes look at one of Europe’s most popular soaps – Sturm der Liebe (Storm of Love). The funny part is they have asked me to come again to play a hotel guest. This would be the third time in as many weeks. It is not hard work, but it’s very tiring as we typically wait three to five hours between sets, which last about ten minutes of us walking back and forth through the ‘hotel lobby’. In reality I wonder why I continue to say ‘yes’. Perhaps it has to do with the memories of being home from school with a cold, sitting with a steaming bowl of Campbell’s soup balanced on my lap, as I watch Nikki trick Victor yet again. I managed to take the bath I had promised myself yesterday after being in the cold all day in Munich. It was divine. Want to know another irony? I sent my fully corrected manuscript via DHL (for tracking purposes -honest!) on Monday. They said it might take two days. It arrived exactly 24 hours later on my editor’s desk in New York. It went from Munich to Leipzig to New York in that time. And I swear the delivery guy looked just this one! A TV crew is filming my husband and me next Saturday. They are going to observe what happens when a couple tries to live without petroleum products for a day. We’re not just talking about the classic stuff such as heating oil and automobiles. We’re talking about the mineral oil in your make-up, the plastic spatula to dish out food, the hairbrush you use in the morning. Even your toothbrush! Ewwww! It is for a good cause, though. The science program, Faszination Wissen (Fascination Knowledge), is trying to show how far-reaching our use of oil goes. We’re excited. And nervous. And wondering how slow our lives will be in a week! Oh, and you want to know the best part? It turns out I know the TV host, but that’s not how we learned about the opportunity. If I told you, you wouldn’t believe me. 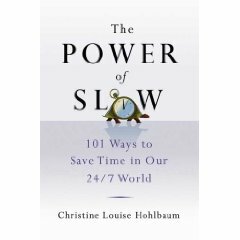 Synchronicity, and the power of slow, are at work once again! A few weeks ago I sat down for a phone chat with Montreal-based Karen Coshof, a smart, forward-thinking film producer who made a 2006 documentary called The Great Warming. It is not only a direct look at what we are doing to the planet, but what we can do to avert more damage. I found out about the movie through a Balance magazine article with Alanis Morissette, who happens to co-narrate the film with Keanu Reeves. The movie did not get as much as play as it could have because Al Gore’s movie, An Inconvenient Truth, came out simultaneously. It was unfortunate timing; nonethless the movie merits attention for its straight-forward approach. Besides, Karen went to amazing lengths to secure her fellow Canadian moderators. Both Alanis and Keanu agreed to do the voiceover for virtually nothing. In the film, Karen advocates stewardship, not destruction; personal responsibility, not the blame game. She views the Earth as an intelligent organism that can do very well without us. In fact, the Earth will survive. We, the human race, may not. In her view, overpopulation is the number one reason for our problems today. Not only do we need a paradigm shift about what to do with our empty yoghurt containers, but also about how we populate the planet. She admits she has gotten into some hot water with conservatives who disagree with her theory, calling her an offense against Nature. To truly get to a Slow Planet, we need to reevaluate our thinking. The Great Warming is a great start. If you don’t get TUT…A Note from the Universe, I’ll share mine with you here. Today’s is particularly appropriate for the power of slow. It’s all about perspective. One of my favorite things about time and space, Christine, is that absolutely NOTHING can ever happen there that can’t be seen as a blessing in some wonderful way. Life really is about perspective. If you think the world is going to hell in a handbasket, guess what? It is. Or if you think the sun is shining brighter today than any other day, you’re right. Nothing’s true but thinking makes it so. I’m saddened by jaded people who play the ‘ain’t it awful’ routine. It is a dead-end way of thinking. Find your own voice and sing the scales to your own tune. Make the world a better place by remembering it’s all a matter of perspective. No one’s is right or wrong, but yours is right for you.